Greetings! Today I’d like to continue with installment eight of manatee trivia, where I’ll give you a Q&A on my very close cousin – the dugong! What is the main difference between the dugong and the manatee? The main difference between the dugong and the manatee is that the dugong’s tail is fluked like a whale’s tail, where a manatee has a paddle-shaped tail. What is the average size of a dugong? The dugong’s average size is 8 to 10 feet long and it has an average weight between 510 to 882 pounds! Clearly, the dugong is one of the biggest mammals in the world! Is the dugong an herbivore like its manatee cousin? Yes, the dugong is an herbivore and just like a manatee its diet consists of seagrass and aquatic plants. Yes, dugongs are warm-blooded just like their distant manatee cousins. They prefer water temperatures above 68 degrees Fahrenheit. 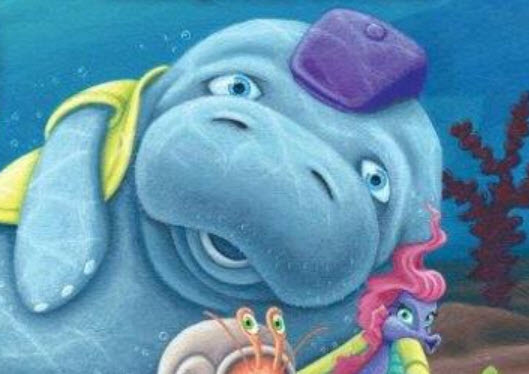 Where can you find dugongs? Dugongs are found in a large range, which arcs along the east coast of Africa, across to southern Asia and down to Australia. They have typically been observed in 37 countries. 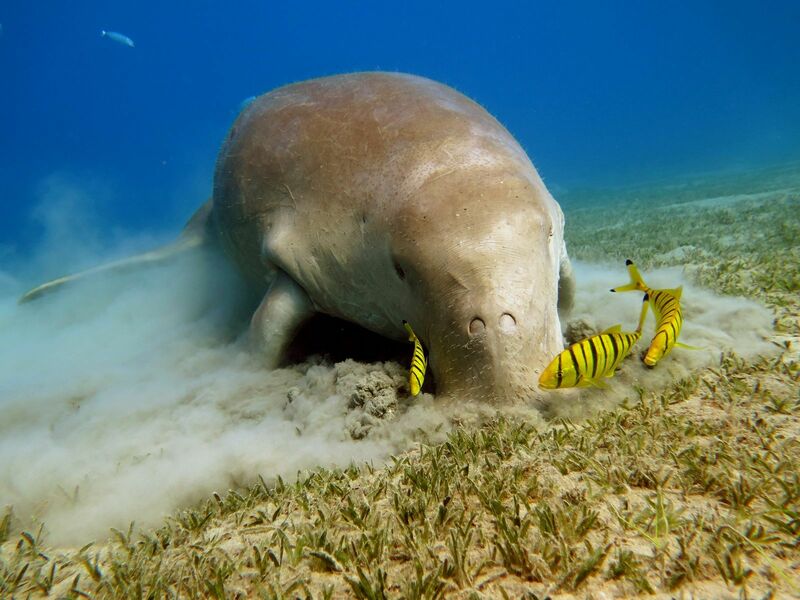 And like its manatee cousin, the dugong typically inhabits shallow waters with an abundance of seagrass. However, the dugong has been seen in water as deep as 75 feet. Is the dugong related to the elephant like its manatee cousin? Yes! And the male dugong has tusks coming out from its gums, however they are not visible when the mouth is closed. Does the dugong have any enemies? Yes! Killer whales, crocodiles, and sharks prey upon the dugong. And just like its manatee cousin, the main threat to the dugong is humans. Can dugongs migrate like their manatee cousins? Yes. Studies by James Cook University reported that while many “dugongs traveled less than 9 miles, some went as far as 348 miles. What is the reproductive rate of a dugong? As with the majority of large mammals, the dugong actually has a low reproductive rate. On average, one dugong calf is born every 2 to 5 years! Which country has the largest population of dugongs? Northern Australia has the largest population of dugongs. The species is protected there and the dugong population is estimated at 85,000. Can a dugong ever leave the water? No. The dugong lives in water its entire life. Manatee Trivia (Part 8) – The Dugong!